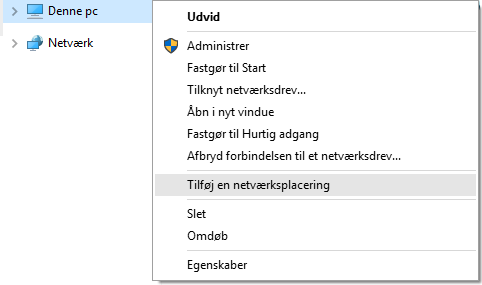 Right click on "This PC" and press "Add a Network Location"
Make sure "Select a custom network location" is selected and press "Next"
Enter the address of the FTP server. The address is just ftp: // followed by your domain name and press "Next". If the picture below says ´ftp://ue-example.com`, but ue-example.com is just the domain name we use as an example, and of course you have to write your own domain name instead. Uncheck the box next to "Log in anonymously" and enter the username for your FTP and press "Next". Give the connection a name. The name doesn't matter, you can just call the connection what you want. Check the box for "Open the network location when I click Finish" and press "Finish". A window will appear asking you to enter your username and password. You can just leave the username, but enter the code for FTP next to Password in the window and press "Sign in"
You can choose to check the "Save password" if you do not want to write the code every time you use the FTP connection. If you do not know the password, you can log in to our control panel, tap your web space and tap Login information. There you can reveal the password for FTP by typing the code for your UnoEuro account. You should be able to use the FTP connection now. You can find it under "This PC" in the explorer. Can I have more than one FTP account?